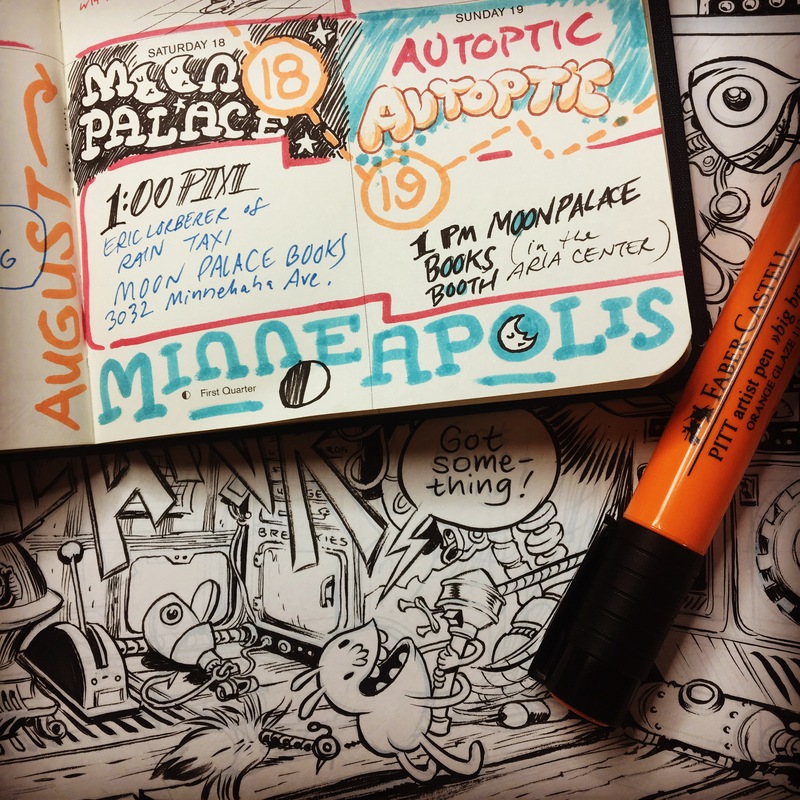 In Minneapolis this weekend for the AUTOPTIC FESTIVAL! Store event at MOON PALACE BOOKS (3032 Minnehaha Ave.) on Saturday the 18th, 1PM, moderated by Eric Lorberer of RAIN TAXI. And signing at Moon Palace’s booth in the Aria Center on Sunday the 19th, also at 1PM. Hope to see some of you there! 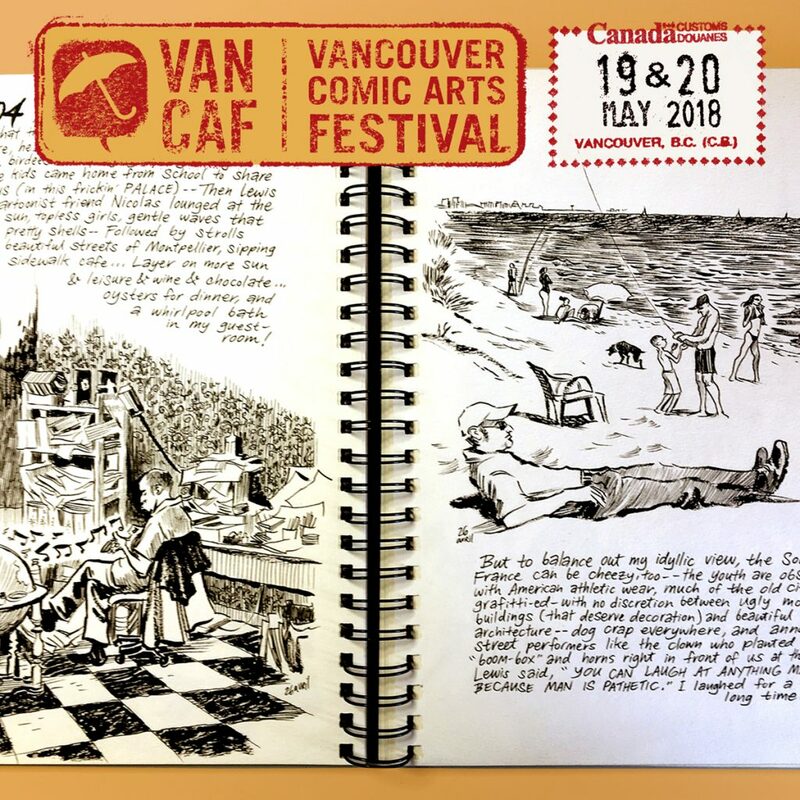 This coming weekend, I’ll be VANCAF comics art festival in Vancouver, BC, promoting the new edition of CARNET DE VOYAGE. Saturday, May 19th, signing from 2-4PM. Sunday, May 20th, spotlight panel 1:30-2:30, signing from 3-5PM. Eager for some overlap with my old friends, Brigitte Findakly and Lewis Trondheim, who both share pages in CARNET! Hope to see some of you there! 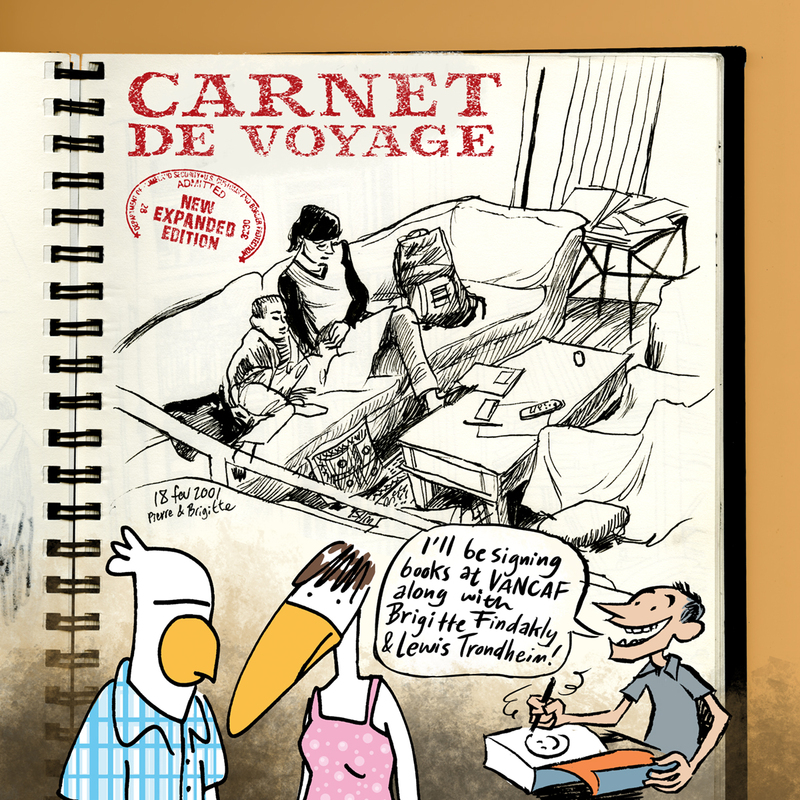 Drawn & Quarterly‘s new expanded edition of CARNET DE VOYAGE is in stores everywhere as of today. 32 new pages, larger hardcover format, new cover, back in print after a decade! 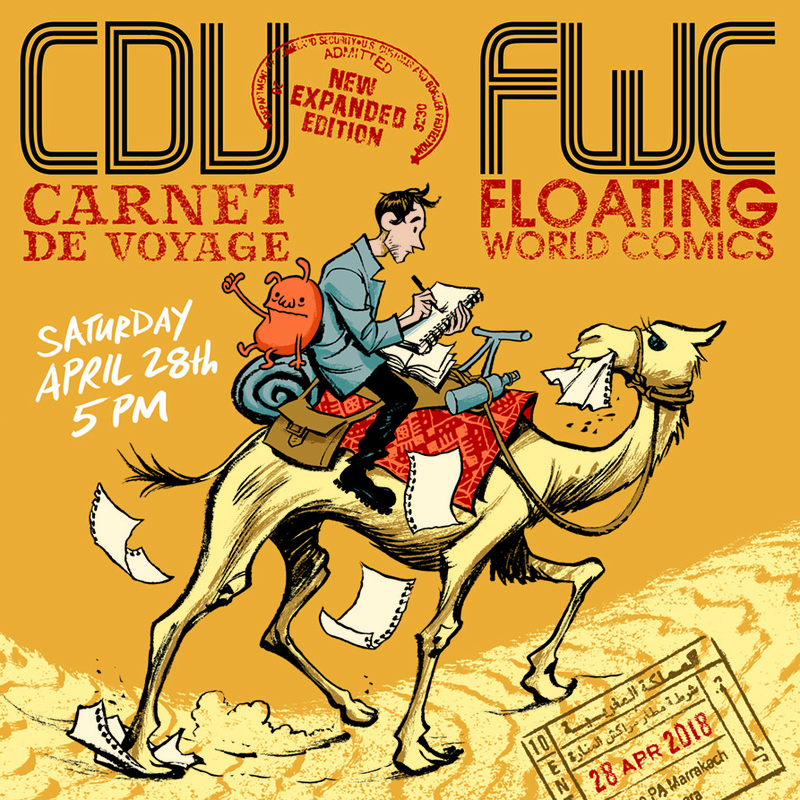 In Portland, FLOATING WORLD COMICS will be hosting a release party / book signing / presentation: Saturday, April 28th, 5PM! Hope to see some locals there! In the meantime, thanks to all you readers, internationally, for supporting this humble travel diary! Thanks for the reminder about the Cintiq post, Dan. As mentioned back in August 2013, I’ve been experimenting with the Wacom Cintiq as a way to shake up & expand my working methods. The 13″ felt too cramped & claustrophobic, so early this year I upgraded to a 22″ Cintiq on an Ergotron arm – inspired by Fiona Staples, whose work on SAGA I admire. For the past couple of months, I wrestled with the machine & have settled on a compromise common among comics pros – I pencil the pages digitally, then print out blue lines and ink on actual paper. The advantage of digital penciling is I can see a chapter all at once (top right photo), cut&paste, zoom in close, edit on the fly, and work standing up (top left photo, avec Momo). But digital inking still looks too slick to me — I prefer the flawed & tangible qualities of fussy sable brushes on paper. 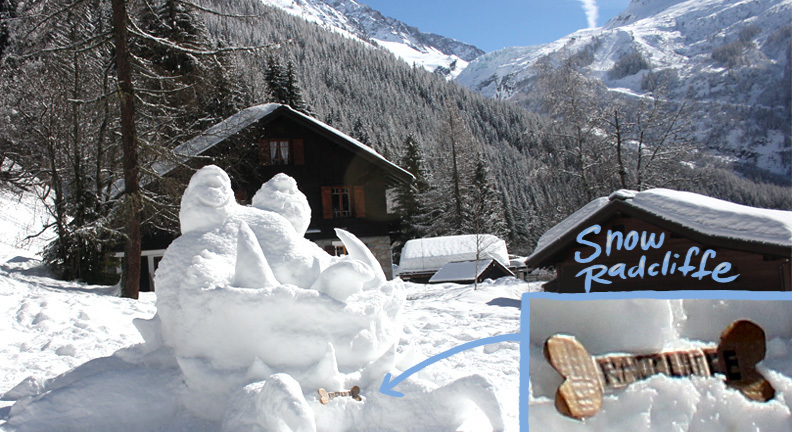 Foot in both worlds! Finally, my advice to young cartoonists is to keep it organic & raw and not get bogged down by plug-in devices. In a month, I’ll be starting a direct-to-sketchbook project like CARNET DE VOYAGE to relearn working on the fly outside the studio. 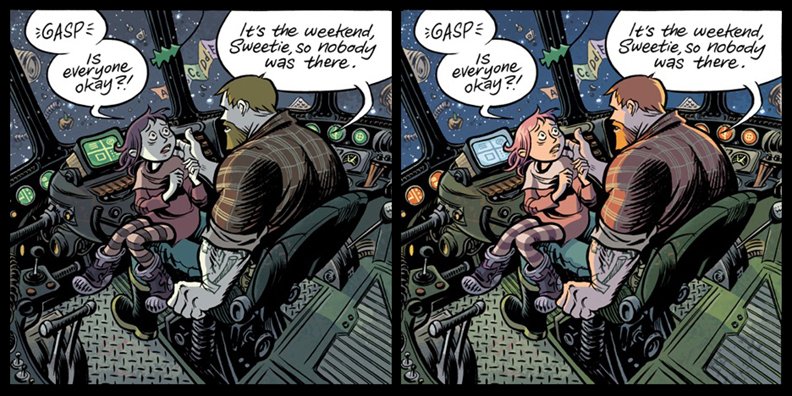 Just wanted to share some of the incredible work Dave Stewart’s pouring into the SPACE DUMPLINS colors. We decided the palette was getting too muted & subdued, so he’s tweaking the pages just enough to infuse the grimy dinginess of outer space clutter with a burst of cartoony, kid-friendly levity. 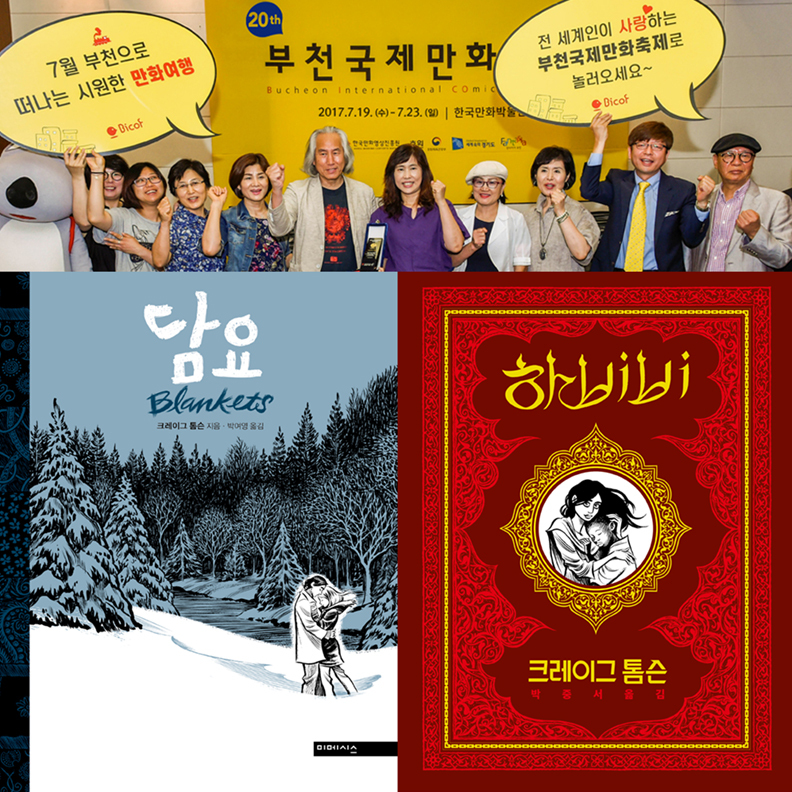 Previous incarnations on the left – updated versions on the right. 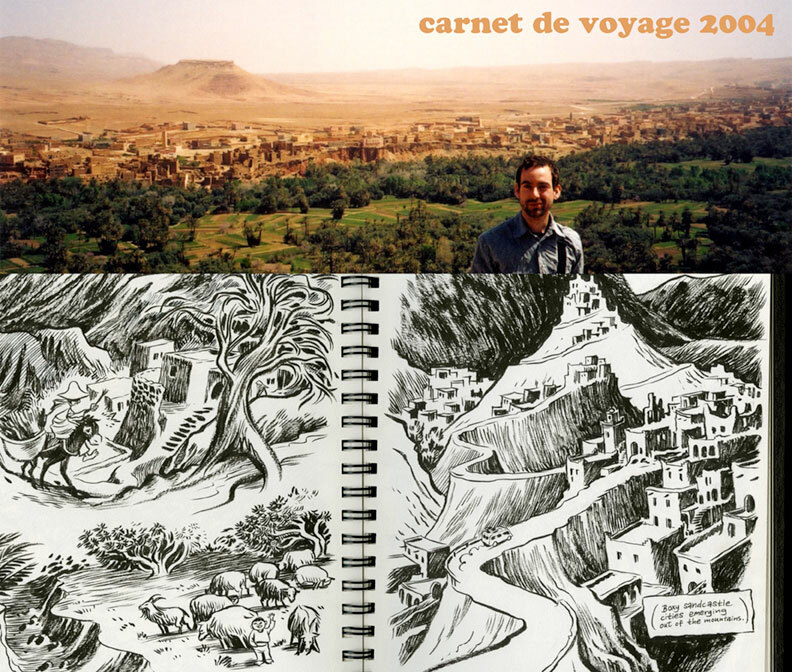 In other news, I realized that today is the exact ten year anniversary of my CARNET DE VOYAGE travel & book. To celebrate, I dug around for a photo or two, but they were sparse, because as noted in the back of the book, zero cameras were used in the creation of it. It is my unaltered travel diary begun March 5th, 2004 and ended May 14th, 2004. The week following, my buddy Frédéric and I scanned the three sketchbooks and layed out the book in Lyon, France – no edits other than a proofread from my non-native English speaking friends. After spending 6-7 years on HABIBI, I can’t fathom that I created a book in less than three months. It helps to not make anything up, not edit, not use any photo reference, and avoid penciling as much as possible. First scruffy photo is in Morocco on the journey to Merzouga. The second photo was provided by Lewis Trondheim – me drawing on the beach in Montpellier, France: young, naïve, skinny & shirtless. 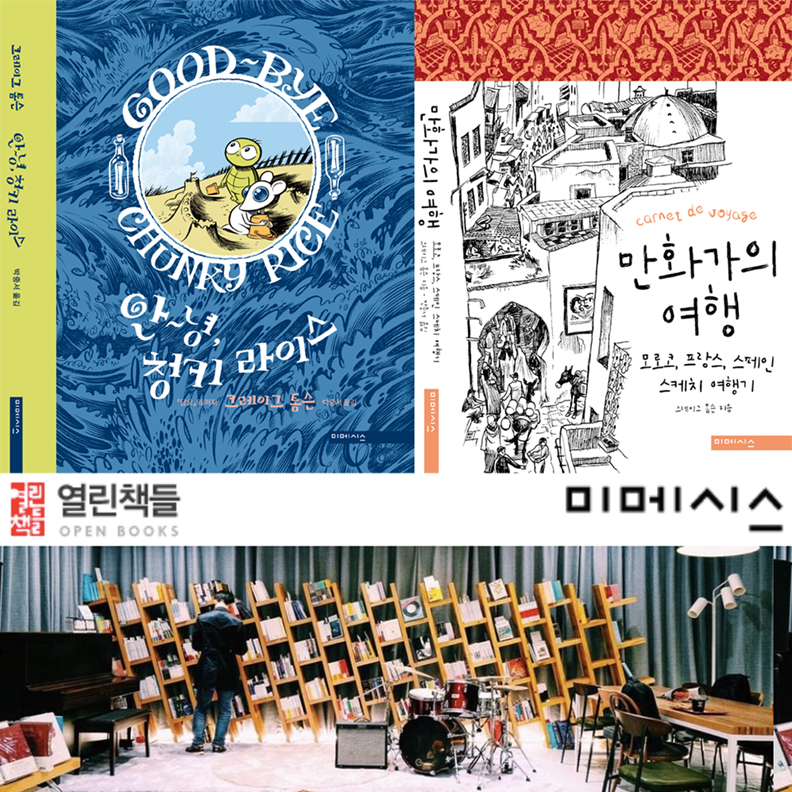 My Korean publisher OPEN BOOKS translate my work with incredible attention to design & production. 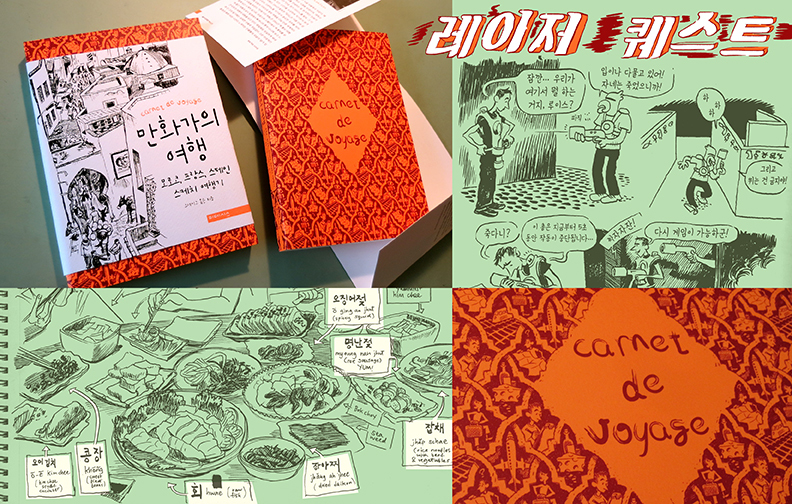 Check out their edition of CARNET DE VOYAGE with a 3/4 jacket. was the first to translate & publish Trondheim’s work in the US. 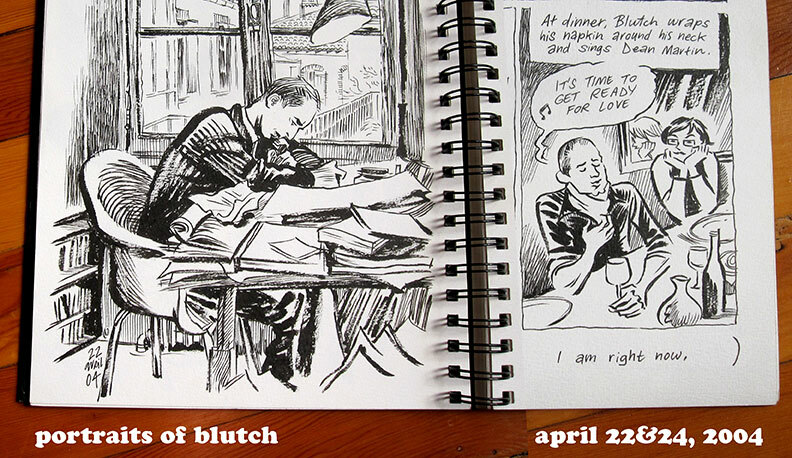 BOINGBOING recently posted my interview with Blutch – an inspiring & influential cartoonist to myself and many others. The first of his books to be published in English – SO LONG, SILVER SCREEN – is debuting this month from Picturebox! Below is the the only photo I could find of Blutch and myself – at Angoulême festival in January 2005. And there’s a smattering of Blutch’s prolific bibliography. While working on Blankets, I poured so devotedly over Blutch’s pages that it emerged as unconscious swipes in my own work. Here’s just one sample where I mimicked him without even realizing – a common affliction in young, impressionable cartoonists. And here’s a couple of portraits of Blutch from CARNET DE VOYAGE. That 2004 visit to Toulouse, France is referenced often in the Boingboing interview. Treat yourself to Blutch’s new book finally in the US! zach & mo & krejg. During my March 5 – May 14, 2004 travel diary CARNET DE VOYAGE, this little bean-bodied critter invaded my sketchbooks as a conscience to counteract my whining & sentimentality. Nine years later, it’s satisfying & familiar to revisit the character in the pages of SPACE DUMPLINS, though I seriously envy how off-the-cuff I used to churn out the pages. The critter has a name now – Zacchaeus – after a favorite wee little tax-collector from the Bible. There’s a new presence in my work studio that shares the same energy as Zacchaeus – frisky & distracting & never tolerating the whining – a kitty, name of Maurice (no Biblical reference). Here she is surveying new and old appearances of Zacchaeus. To the right, she protects the drafting table from her throne of crumpled jackets. In other news: A) I’m participating in an exhibition at the Cartoon Art Museum in San Francisco with an amazing cast of illustrators. I SEE WHAT YOU SAY opens March 23rd. And B) the latest foreign edition of HABIBI to debut is from my Serbian publisher Komiko. I wanted to mention it, if for no other reason because I like seeing my name spelled “Krejg”.